To me, passion fruit is such a magical ingredient – I love its color, taste, smell... Slice one passion fruit in half and in a couple of seconds your kitchen will be completely taken by that delicious aroma. So revigorating. In a gray day like today – and by gray I don’t mean only the color of the sky – I wish I still had some of those cheesecake squares around. Place the cookies in the bowl of a food processor and process until they resemble fine breadcrumbs – I placed them in a sturdy plastic bag and crushed with a rolling pin. Add the butter and mix to combine. Press the mixture into the base of a 20x30cm lightly greased rectangular pan lined with baking paper. Refrigerate for 30 minutes or until firm and cold. Preheat the oven to 160ºC/320ºF. Place the ricotta, cream cheese, caster sugar and lemon zest in the bowl of a food processor and process until smooth – I used an electric mixer. Gradually add the eggs, processing well after each addition. 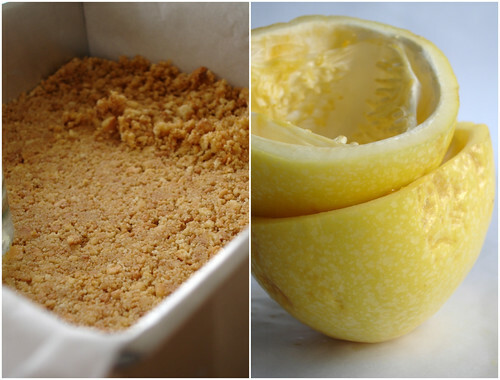 Fold through the passion fruit pulp and pour mixture over the base. Bake for 25-30 minutes or until set. Allow to cool completely; carefully slice to serve. That sounds incredible! Passion fruit really is like pulpy sunshine. Trying not to let my boyfriend see, if he does I'll have to make them for him! Mmm, cheesecake. 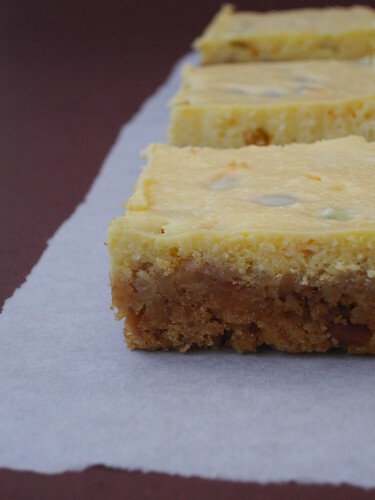 I love cheesecake squares because you get all the flavor and don't have to deal with the water bath! I've never had fresh passionfruit! I wouldn't know how to pick one. Your bars are gorgeous. Where oh where will I ever find maracuja in the states (Idaho no less, lol) ?? I need to make these! I love passionfruit :-) .. and this recipe sounds great :-)! Those look lovely! I will have to try!!! I love passionfruit too... you're right how the aroma can transform your kitchen, I was luck enough to live in a house with a passionfruit vine out the back.. I'd forgotten about that. You know, for as much as I adore passion fruit, I've never actually worked with it. 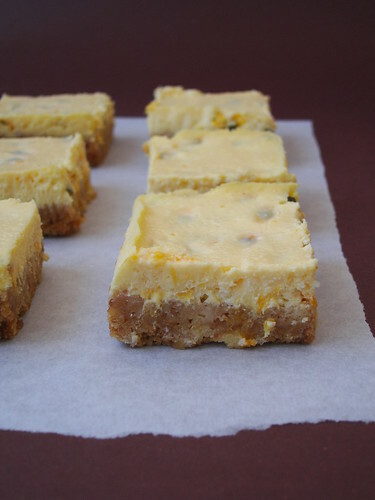 These cheesecake bars look amazing; I'm definitely going to have to get myself some passion fruit now! What a fabulous job you've done!! Great minds think alike. I've just been cooking with passionfruit as well. I love them!! Pea, I knew you would love these, darling! And you are so right about the water bath - these are much simpler! Rose, let me know if you do! Tks for stoppping by! Jules, I got the recipe from an Aussie and she used the purple passion fruit you have there. Thank you for stopping by, dearie! Elyse, I grew up drinking loads of passion fruit juice, but only started trying different recipes with it very recently (like in cakes, jellies, etc). Can't wait to try some more! KJ, I'm sure you made something delicious! Yum! Those look creamy, rich, and so tasty! I adore passion fruit and I think it would be perfect in a tangy cheese cake! Once again, lovely job!! Oh, I love passionfruit. We used to have a tree here in Los Angeles...ours were deep purple in color and full of yum. What a perfect combo of cheesecake and fruit! I love Donna Hay too! I wish passionfruit was easier to find here. It's not often I get to smell its lovely aroma. Those bars look awesome! I love it when I come across something this unique! These bars looks sooooo good! They look like a great dessert for summer bbq on the deck! Thanks! I've been scouring the internet for passionfruit cheesecake and yours is the best recipe I've found so far! I'm going to follow your recipe and make this cake for my fiance's birthday next week. Do you think I would be able to make this recipe up in a round (springform) tin instead? I'm so glad to know you'll try the recipe - let me know how it turns out, please? We've got 10 beautiful ripe passionfruits sitting on our counter from the Farmers Market. All I got to do now is to convince my fiance not to eat them all up without him guessing what I need them for!